December 9, 2010 – One of the top Running Backs in the United States for the class of 2011 is Terrance Magee of Franklinton High School who is committed to LSU and loves the LSU Tigers. I had a chance to talk to Terrance this week and get an update on his recruiting and the season itself. 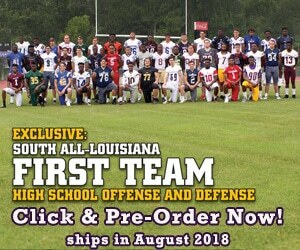 Terrance is listed as a QB for his high school, but will play RB in college at LSU. Terrance told me his final season stats for 2010, which by the way will blow you away, are 2,421 yards passing with 33 Touchdowns as a QB, and 1,221 yards rushing and 18 Touchdowns, That’s an amazing 51 Touchdowns in one season combined Running and Passing. Terrance will lead Franklinton to the Superdome 4A State Championship for a second year in a row. Franklinton plays a really good Edna Karr team at 4:00 PM in the Superdome this Saturday. What I love about this kid is he’s super strong in his legs, and very tough to go along with the speed and quickness that you need to be good in the SEC brand of football. Terrance is 5-8 to 5-9 and weighs a lean 210 pounds. He reminds me of a Mark Ingram of Alabama in build and running style. He has the Ingram legs and power and quickness. I feel he’s very under the radar by all the National Recruiting Services; maybe they need to see him in person, and then his ranking will go up. I asked Terrance about his commitment to LSU and he said, “That’s the only School I’ve ever wanted to go to.” His most enjoyable games this year in high school were Salmen and Haughton. I asked him about his trips to LSU and he said the West Virginia game was his best visit, but he also loved the Alabama game.